Nigel Utton first came to live in Norwich in 1982 when he studied Russian and French at the University of East Anglia. After completing his degree he worked at the Hamlet Centre as Toy Librarian before starting an, albeit brief, career in the civil service at Norwich 4 Tax Office on Upper King Street followed by a spell in Martin and Acock accountants. After a long hot summer stuck in an attic in Cathedral Close adding up numbers, Nigel realised that his vocation lay elsewhere and he went off to train to be a primary school teacher. A career which took him to the dizzy heights of Headteacher for ten years in both Hampshire and Kent Primary schools. The changes in education, which have left so many talented people bruised and battered, forced Nigel to rethink his future and, rather than become disillusioned or head for a nervous breakdown or even untimely death, like far too many of his colleagues, he decided to retrain as an osteopath. 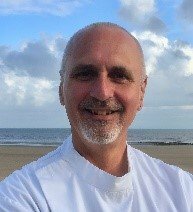 His interest in osteopathy was kindled by a lifelong interest in alternative approaches to medicine and some very effective encounters with osteopaths. He was hooked when an osteopath treated the eczema which had been on his son’s belly button from birth to age 18 months. Just one ‘visceral’ treatment from the osteopath cleared up the problem in 12 hours! Something that conventional medicine had not been able to influence because it did not tackle the actual physical cause of the symptoms. Nigel took the brave step of leaving his job as a Headteacher, sold his house in Kent and funded himself through the four-year masters degree. 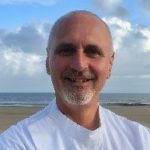 He graduated with a first-class with honours from Swansea University and a special interest in the osteopathic treatment of headaches – which was the subject of his masters dissertation.